Mesut Ozil Becomes the Highest Ever German Goal Scorer in the Premier League! Mesut Ozil played a key role in Arsenal’s victory over Leicester at the Emirates. The German scored the equalizing goal and provided a key assist to provide Arsenal with a 3 – 1 victory in the league fixture. With this goal Mesut Ozil has now become the highest ever German goal scorer in the Premier League. He has now scored 30 goals. Before Mesut Ozil, the record for the highest number of goals scored in the Premier League by a German was held by Jurgen Klinsmann and Uwe Rosler who both have 29 goals. Other notable German goal scorers in the premier League include Rober Huth, Lukas Podolski, and Michael Ballack. Ozil has been phenomenal for Arsenal since joining the club in 2013. The player is an integral part of the Arsenal midfield and is considered to be the anchor person in the team. Ozil has played 149 matches for Arsenal and has been able to produce 30 goals. Before that he was a part of Real Madrid where he played 105 matches and scored 19 goals. Ozil also scored 13 goals his previous club Werder Bremen in 71 matches. 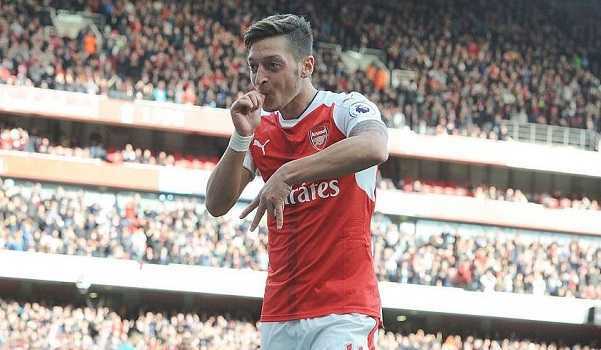 It seems likely that Ozil’s record of highest German goal scorer in the Premier league will stand for a long time to come as the player is expected to improve on the current record. Manchester United is ready to pay £113 million for Gareth Bale?